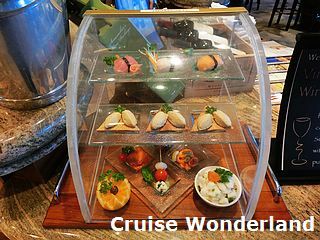 Distinctive upscale Specialty Dining options can be found on Golden Princess. The two alternative restaurants, Sabatini's and Crown Grill, offer memorable dining experience in intimate surroundings. Each of them has a distinctive menu with traditional and regional favourites. On the other hand, the Vines Bar can be found in The Piazza which is stocked with a wide selection of wines. Sabatini's on Deck 7 serves authentic Italian fare. It features a menu with antipasti, pasta dishes and seafood main courses in a refined yet casual trattoria setting reminiscent of a Tuscan villa. Opening for dinner from 18:00 to 23:00 every day, it is a perfect place for romantic dinners or special occasions' celebrations. Reservations are required and should be made as soon as possible since this restaurant is extremely popular, generally regarded as the best dining venue on Princess' ships. A per person cover charge of US$20 applies. However, there is no lunch provided, and breakfast is only served for suite guests complimentarily. Another specialty restaurant is Crown Grill on Deck 6, which was added to the ship since 2009. It offers a special dining experience with an open, theatre-style kitchen where chefs custom-prepare the food. Premium aged beef, fresh seafood including grilled fish, shrimp, lobster, scallops and other cooked-to-order steakhouse favourites are the focuses in the menu. Adorned with dark wood panels and soft lightings, this restaurant has an elegant and classic atmosphere. Reservation-required dinner is open from 18:00 to 23:00 daily in which a per person cover charge of US$25 applies. During the days at sea, complimentary British-style lunch with traditional pub fare and beers is also available for all passengers. The Vines Bar is a wine and seafood bar at the lowest level (Deck 5) of The Piazza. It serves an array of unique new- and old-world vintage wines by the glass, together with many gourmet delicacies. Complimentary sushi, tapas and artisan cheese are available with any beverage purchase. 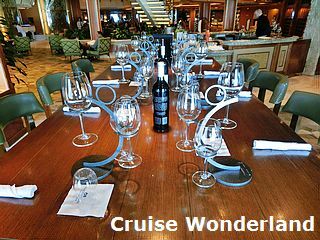 During the Stammtisch (meaning "communal table" in German) events which are usually organized a few times in the cruise, guests can enjoy special wine tasting and cheese pairing with some suggestions given by the sommelier. There is also the Vines Shop adjacent to the bar, where wines as well as branded chocolates and sweets are sold.